This is an A grade item. Type RS Valve - Atmospheric. The Forge RS valve has been specifically designed and engineered, to offer extreme flow rate capability, where other valves are just not up to it. Often when engines have been tuned by installing larger turbos or even software upgrades improved turbo response can be acheived by fitting the RS valve which has the greater internal mass air flow specification utilising an amazing 50mm (2) bore. For fine tuning there is a variable spring preload incorporated and a ratchet type top adjuster that will allow for the positive and precise adjustment that your driving style demands. To ease installation a 360 degree adjustable vacuum hose connector With a choice of inlet and outlet connections the RS valve can be matched to your engine perfectly. This valve incorporates a unique conical, progressive rate spring that can allow for the retention of boost pressure from 7 to 34 PSI depending on the individual user's application and level of adjustment. This unique spring design will also allow for unrestricted piston travel and flow volume regardless of the amount of pre-load adjustment added to the spring. Other manufacturers valves using cylindrical springs with adjustable pre-load often experience restricted piston travel and flow volume within the normal range of valve adjustment. Please note: When configured as a Dual-Piston Atmospheric Valve. All Forge Motorsport Dual-Piston Atmospheric Valves have been designed and built with the intent of venting 100% of the residual charge air remaining in your forced induction system to the atmosphere at throttle lift. While we have incorporated many elements into the design of the Dual-Piston valves to aid in their compatibility with mass air-flow sensor equipped vehicles, we cannot always guarantee that each individuals application will be compatible with a valve that vents the charge air into the atmosphere. Forge Motorsport nor any of its Authorized Distributors can assume any responsibility for any adverse effects resulting from the installation of this valve onto a vehicle whose engine-management-system, whether factory or aftermarket, is not capable of compensating for the loss of metered air through a vent-to-atmosphere valve such as this. Please specify valve finish and hose connector diameter when ordering. A - Brand new item with full Forge Motorsport guarantee. B - Item may have been an ex-display item, reconditioned or a customer return. C - Item may have cosmetic damage e. May have damaged packaging or no packaging. Will be 100% fully functional. This part is manufactured by Forge Motorsport , It is genuine. 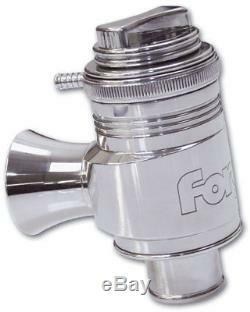 The item "FORGE MOTORSPORT TYPE RS DUMP VALVE" is in sale since Monday, June 27, 2016. This item is in the category "Vehicle Parts & Accessories\Car Tuning & Styling\Engine, Tuning & Chips\Other Engine Tuning". The seller is "forgefactoryshop" and is located in Gloucester.